DVD Entertainment System, Moonroof, Navigation, Third Row Seat, Heated Leather Seats, Captains Chairs, Trailer Hitch. Reserve trim. SEE MORE! Leather Seats, Third Row Seat, Navigation, Sunroof, Panoramic Roof, 4x4, Quad Bucket Seats, Power Liftgate, Rear Air, Heated Driver Seat, Heated Rear Seat, Cooled Driver Seat, Back-Up Camera, Running Boards, Premium Sound System Rear Spoiler, MP3 Player, Privacy Glass, Remote Trunk Release, Keyless Entry. LINCOLN PLAY: Rear-seat entertainment system w/wireless headphones, HEAVY-DUTY TRAILER TOW PACKAGE: Slow Climb Drive Mode, Two-Speed Transfer Case, Heavy-Duty Radiator, Pro Trailer Backup Assist, Trailer Brake Controller (TBC), Electronic Traction Assist (eLSD), WHEELS: 22 6-SPOKE ULTRA-BRIGHT MACHINED-ALUMINUM: dark tarnish premium painted pockets and high gloss finish, CARGO PACKAGE: Tiered cargo area management system w/4-way configurable partition, Chrome Roof Rack w/Crossbars, INFLATABLE REAR SAFETY BELTS - 2ND ROW, ENGINE: 3.5L TWIN-TURBOCHARGED V6: (STD), TRANSMISSION: 10-SPEED AUTOMATIC W/SELECTSHIFT: paddle activation (STD), EQUIPMENT GROUP 300A RESERVE. 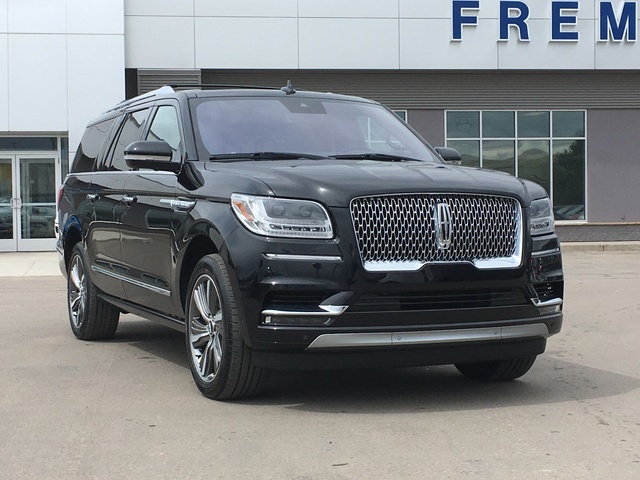 Lincoln Reserve with Infinite Black Metallic exterior and Ebony interior features a V6 Cylinder Engine with 450 HP at 5500 RPM*.